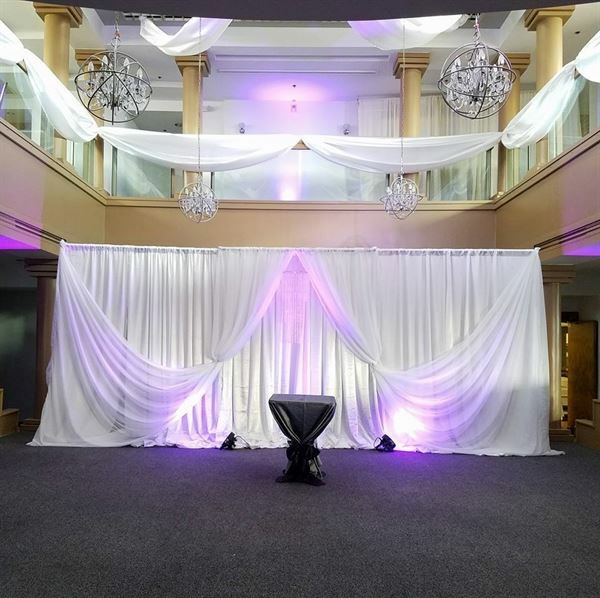 The View Event Center by Simply Décor and Events is a beautiful venue with panoramic views of the city. The venue is located in the great northeast heights located on Tramway and Indian School. The View of Albuquerque is a high-end venue with cooperative and experienced staff, ready to assist you in making the memories of a lifetime. Our contemporary design and customization options make us a premier venue for weddings, business parties, and other celebrations. The View of Albuquerque is the perfect location for your next event. If you choose to do your ceremony on site, we offer both indoor and outdoor options. The Main Hall is a popular choice for receptions because of the beautiful floors, including a raised floor and the crystal lighting. What a great venue for any event. We just had our annual fundraiser and everyone raved. The owners are on top of everything. Things went very smoothly. I would recommend The View to anyone. We held our Kickstarter Launch Party at the View and were pleased with everything from the customer service to the venue itself. The location is perfect, the staff is friendly, helpful, and accommodating, and their pricing is very reasonable and competitive to alternatives in Albuquerque. I highly recommend this venue for any special event. The View event center, Akshay and Annette were all amazing.. Booked the venue way back when they first bought it, and they did not disappoint. They did everything that they said... From re-modeling the downstairs area putting in hard wood floors, re- modeling the bathrooms, new lighting and fixtures, outside patio furniture, and so much more..This venue is amazing. It is like no other venue with two stories and amazing views of the city. Akshay was very nice kind and professional. As brides we have a lot of questions all the time and he always returned all of my emails in a very timely manner. They were very organized and knew what they were doing. From all the decoration options, lighting, color options, etc They did everything in their power to make it perfect for our big day. We had about 180 guests at our wedding with a huge bridal party of 14 which included me and the groom, and we all fit without a problem. We had a beautiful head table and all our guest fit comfortably around us, and there was still room for the dance floor. Annette was our wedding planner and she did a incredible job making sure everything was the way i wanted it and made sure everything went smoothly. I can not say enough about both Akshay, Annette and just The View event center in general. Its a amazing new venue. If your still looking for a venue and don't want the normal hotel wedding go check this place out. The only cons is there was no rooms for the bride/bridesmaids and groom/groomsmen to get ready in and hid at the venue, and there is no nice hotel near by to stay at and get ready in...We stayed at the Albuquerque Marriott off Louisiana, which i think is the closest nicest hotel. It wasn't a huge issue for us though it worked out perfectly the way we did it. I still think even without that room this venue is totally worth it, and its easy to figure out a different plan concerning that issue. Overall. I give The View Event Center, Akshay, and Annette 10 stars!! Anyone who uses this place will not be disappointed.